The engine has two temperature sensors, an engine coolant temperature sensor and an intake air temperature sensor, to detect the temperature while the engine is in operation. A thermistor, whose resistance value varies according to the temperature, is built into each sensor. When the temperature is low, the resistance of the thermistor increases. When the temperature is high, the resistance drops. These variations in resistance are transmitted to the ECM as voltage changes. Based on these temperature signals output from the sensors, the ECM determines the fuel injection time and the ignition timing to control the engine. The battery voltage is 10.5 V or higher. 7 hours or more have elapsed since the engine stopped on the previous trip. 90 seconds or more after a cold engine start. The minimum intake air temperature after the engine starts is -10°C (14°F) or higher. Engine coolant temperature before the engine starts is -10°C (14°F) or higher. The difference between the readings of the engine coolant temperature and intake air temperature is higher than 25°C (45°F). Waiting is required to prevent the temperature of the engine from affecting the readings. If the engine has been operated recently, it is not possible to accurately compare the readings. For diagnosis, in order to duplicate the detection conditions of the DTC, it is necessary to park the vehicle for 7 hours. Parking the vehicle for 7 hours ensures that the actual temperature of the engine coolant temperature and intake air temperature are very similar. When the vehicle has been parked for less than 7 hours, differences in the readings may exist, but this does not necessarily indicate a fault. The ECM monitors the difference between the engine coolant temperature and the intake air temperature when the engine is started cold to accurately detect the engine temperature conditions. The monitor runs when the engine started cold after 7 hours or more have elapsed since the engine was stopped (ignition switch turned off) on the previous trip. 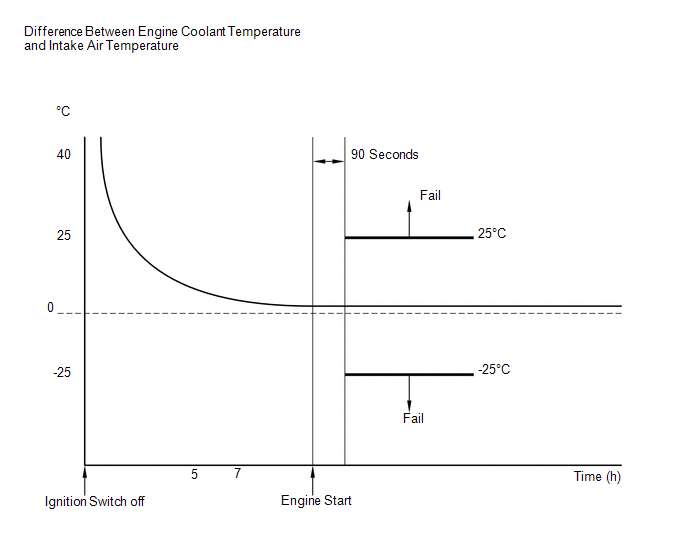 If the difference between the engine coolant temperature and the intake air temperature on a cold start exceeds 25°C (45°F), the ECM interprets this as a malfunction in the engine coolant temperature sensor circuit and intake air temperature sensor circuit, and stores the DTC. With the engine stopped, leave the vehicle as is for 7.5 hours or more [B]. Start the engine and wait 100 seconds or more [C]. If the judgment result shows INCOMPLETE or N/A, perform steps [B] through [D] again. 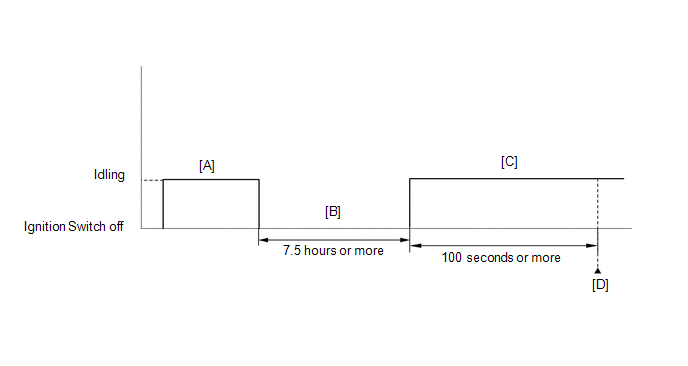 It is necessary to leave the vehicle for 7 hours or more to create conditions similar to the DTC detection conditions. Difference between the intake air temperature and the actual outside air temperature is within 10°C (18°F). Temperature readings on the outside temperature gauge of the vehicle (if equipped) are not suitable for comparing to the intake air temperature reading. The outside temperature gauge has a significant delay built in to prevent swings in the temperature display. Use an accurate thermometer to determine the outside air temperature. The difference between the coolant temperature and the actual outside air temperature is within 10°C (18°F). If the result is not as specified, check that there are no heat sources such as a block heater in the engine compartment.